Keep reading to find out the dangers associated with keeping the two together, as well as what you can do to minimize the chance of harm coming to them. 1 Can Angelfish And Bettas Live Together? 12 Recap – Can Angelfish And Bettas Live Together? The absolute main decider on whether this is going to work or not is the temperament of the fish. If you have an aggressive betta or aggressive angelfish then the chances of them being able to live together are slim to none. But make no mistake, if you have hostile angelfish, they’ll rip your betta apart, and if they’re in a pair they’ll be even more dangerous. Both bettas and angelfish are extremely territorial fish. If anything enters their territory it’s not uncommon for them to attack whatever it is. One of the ways you can prevent this from happening is to make sure you’re buying a tank that’s big enough. Ideally, angelfish should be kept in tanks that are 29 gallons or bigger. If you plan on adding a betta to the mix then you should be going even bigger than that. You shouldn’t put them together in a tank any smaller than 55 gallons. At 55 gallons and bigger, there’s going to be plenty of space for your betta and angelfish to create their own territory, without encroaching on the others. And remember, the bigger the tank is the less likely your betta and angelfish are to be aggressive and territorial. You should also add a lot of plants and decorations to your tank. They’re going to help break the line of sight between your fish as well as making it easy to establish a territory. Natural rocks and driftwood are great for doing this and you can also use big plants like hornwort and anubias to really block of lines of sight between the two fish. They’re also going to provide a lot of hiding places, so if one fish is being aggressive towards another, they’ll have somewhere to hide until you can remove them from the tank and put them somewhere safe. Angelfish only become territorial and aggressive as they age and start breeding. Before that stage, they’re a lot more peaceful and you’ll have a higher chance of success keeping them with bettas. However, this is only a temporary solution. At some point, you may have to move your angelfish or betta to another tank if they start to become aggressive. While female bettas are aggressive they’re not as aggressive as males. This could be one way to keep bettas and angelfish together. However, they can be nippy, so if they start nipping your angelfish he could retaliate in kind. When you first introduce a betta and angelfish together you need to make sure that you keep an eye on them for a few hours. You should watch how they interact with each other. If you notice a small amount of aggression this may be normal, but anything that’s too serious will warrant action. While bettas and angelfish can live together peacefully and it’s been done together, it’s always safe to make sure you have a spare tank ready to remove your betta if something happens. When moving your betta to another tank you should make sure it’s a minimum of 5 gallons, however, as always bigger is always better! If you think your betta is docile and you’re prepared to move him if the two breeds don’t take to each other, then the next step is setting up your aquarium for both bettas and angelfish. Fortunately, they both like similar conditions, so you’re not going to have to do anything drastic. But first of all, let’s talk about the temperament of angelfish. The temperament of an angelfish is going to change depending on the circumstances. Namely, their age, if they’re alone and the size of the tank. Another reason you need to have a big tank is that angelfish become particularly territorial in smaller tanks. When they feel like they’re space is threatened whatever little space they do have they’re going to fight for. As well as this a small tank is going to cause an angelfish to become more aggressive and unhappy, as well as unhealthy over time. You can also expect angelfish to become a lot more aggressive when they pair off. This is when they find another angelfish they’re going to mate with. At this point, they’re going to find their own spot in the tank, and if any fish enter it (especially when they’re breeding) then they’re going to scare them off. And lastly, you should be aware that angelfish are also aggressive eaters. They will stay at the top of the tank when it’s feeding time and eat up as much food as they can before other fish get a look in. Because of this when feeding angelfish you should make sure everyone in your tank is getting enough food. On the subject of aggressive eaters, it’s important to be aware of what angelfish like to eat. While bettas are carnivorous angelfish prefer a mix of meat and vegetation in their diet. So it’s going to be important for you to make sure you take the necessary steps for them to get a balanced diet. Some great food you can use are vitamin enriched flakes, live food, freeze dried food, and frozen food. You should try to aim for a mix of different food so your angelfish don’t get bored and they get a balanced diet. And remember, it’s good for your betta and angelfish to give them a diet with lots of live food. This will not only be nutritious for them, but it also helps to fulfill their hunter instinct, rather than getting the same pellets every day. You should feed your betta a couple of pieces of food a day no bigger than his eye. However, angelfish can be fed more. You can feed them 3 or 4 times a day for about 60 seconds. Just make sure you don’t put in more food then they can eat or it will increase the ammonia levels in the tank. Next, you’ll need to think about what the ideal habitat for angelfish and bettas is. The good news is that they both prefer similar conditions. One thing that you should consider is adding to sand as the substrate instead of gravel, however. While betta’s don’t mind either, angelfish are used to a sandy substrate which resembles the substrate of the rivers they come from. If you’re housing any catfish or bottom dwellers in your tank then they’re going to love the sandy substrate as well! You’ll also want to make sure your tank has plenty of hiding places, and one of the best ways to do this is by using lots of plants. You should aim for plants which are tall and take up lots of space such as anubias, aponogetons and java fern. Not only will angelfish feel safer and less territorial, but it also gives all of your fish lots of places to hide. And counterintuitively, when fish feel like they have places to hide they will become more confident and swim around more. On top of plants, it’s also a good idea to add lots of rocks and driftwood to your tank. These are going to provide lots of hiding places and make the tank feel more natural for your fish as well. And lastly, while it’s not as big of a deal for bettas, you should buy a tank that has a lot of height for your angelfish. Because they grow up instead of out, they’re going to need more vertical swim space. If you plan on keeping angelfish with your betta, lastly, you should only keep them in a tank that’s 55 gallons or bigger. This is going to reduce the chances of aggression. With more space, they’re going to feel less territorial. If you plan on getting angelfish then you should be aware that they can grow large, which is one of the reasons they shouldn’t be kept in a small tank. In fact, if you keep your angelfish for long enough you can expect them to grow up to 6 inches (although it’s not uncommon for them to grow to 8 inches either). And lastly, they live for a long time, if you get them young enough and you take care of them they can live for up to 10 years! Lastly, if you do plan on adding angelfish to your tank then it’s important to make sure you’re adding healthy ones. And even though you should be quarantining new fish before you add them to your tank anyway, picking healthy angelfish from the beginning is still going to save you time and potentially money. First of all, your angelfish should look active and perky. They should be swimming around a lot and not hiding or acting lethargic. As well as this, they shouldn’t be damaged in any way. If you notice that their fins have been bitten or stunted then it could be a sign that other fish have been attacking them. And in some cases, it can also show that they have a genetic defect. And lastly, make sure that all the fins are vertical and erect. There are certain fish that you should always avoid, and this isn’t specific to angelfish. First of all, make sure all the other fish in the tank are healthy and swimming around. If you notice any sick fish then you shouldn’t buy any from that tank, and if you notice a dead fish then it may be better finding one from somewhere else. 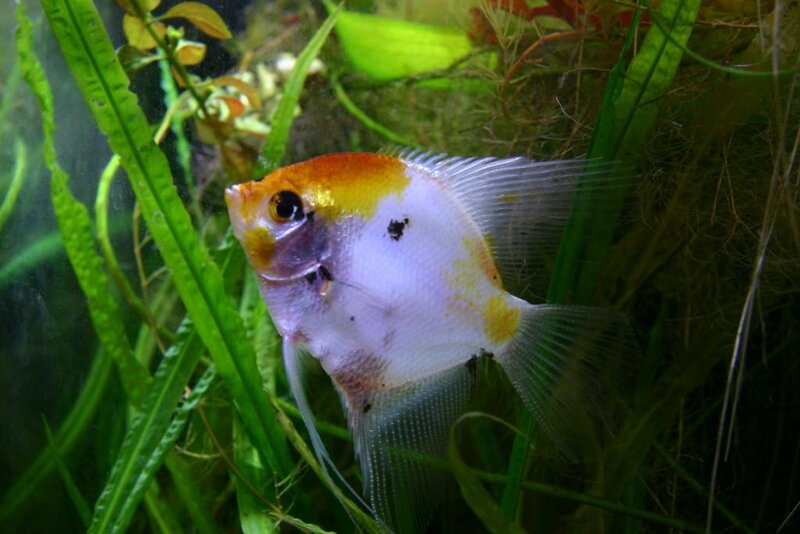 If you notice the angelfish aren’t active and seem lethargic then that’s often a sign of illness as well. And of course, if you spot an angelfish being aggressive in the tank then you should find ones that aren’t aggressive as it won’t bode well for your betta otherwise. Make sure you’re looking for any deformities as well. These are a sign of an unhealthy angelfish and should be avoided. Recap – Can Angelfish And Bettas Live Together? Keeping angelfish and bettas together is going to be extremely risky, and it’s not recommended. However, if you do want to do it, here are a few things to be aware of. Buy a tank that’s big enough, you should be aiming for at least 55 gallons. Make sure you add plenty of plants, rocks, driftwood, and hiding spaces. If you add angelfish when they’re young they’re going to be less aggressive. You could also try keeping female bettas with the angelfish as they are also less aggressive. 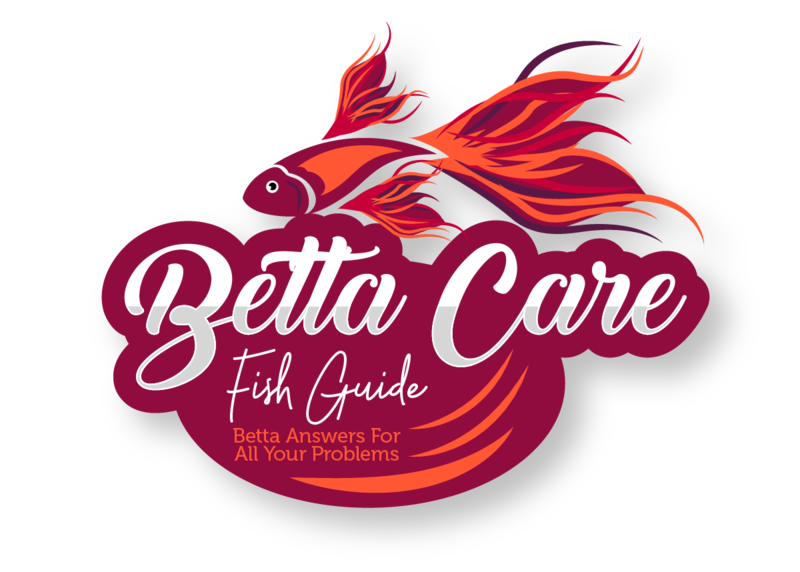 If you are going to introduce the two fish together keep an eye on them and be prepared to move your betta to another tank if you see aggression. 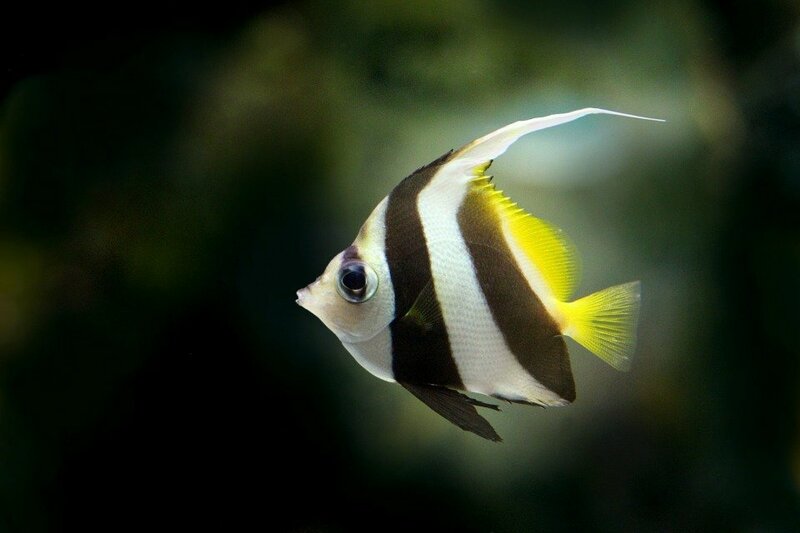 Angelfish are naturally aggressive and territorial just like bettas. However, giving them lots of space and places to hide is going to prevent this from happening. They’ll also be less aggressive when they aren’t paired up. Angelfish are omnivores, so you should feed them a mix of plant-based food and meat-based food. Make sure you pick a healthy angelfish. They should have erect fins, no signs of damage or stunting, and they should be active, not lethargic. If you liked this article check out the rest of the website. And if you have any more questions leave them below, otherwise have a great day!